Fuji entered the mirrorless market this year with the X Pro1, will Canon join too? According to Adrian Clarke, Fujifilm Imaging's vice president, if Canon announces a compact system camera at this year's Photokina, as many believe it will, the mirrorless camera market will take a major step forwards. Speaking to TechRadar, Adrian Clarke, Fujifilm Imaging's vice president said, "Most of the action and innovation from the majority of brands is within CSC, and it's just a question of whether Canon joins the party this year. "There's lots of rumours that they will, and if they do, probably that will accelerate the adoption of non-mirrored cameras. If Canon keep away, if they make a statement that they don't believe CSCs are the way forward, they'll take a lot of people with them." 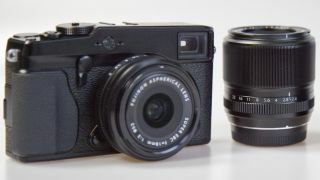 Fujifilm entered the CSC market earlier this year with the X Pro1, which features an APS-C sized sensor and has been very favourably reviewed. Several predictions suggest that compact system cameras will overtake traditional DSLR sales in the UK in the next few years, whereas in Japan they already selling at 51% (of all interchangeable lens cameras). In 2008 Panasonic introduced the first of the new breed of mirrorless system cameras, closely followed by Olympus. Meanwhile photography giant, Nikon was slower to react. In fact it wasn't until towards the end of 2011, that Nikon finally revealed its interpretation of the compact system camera with the Nikon 1, which features a small, 1 inch sensor. It's been rumoured that Canon, in a bid to distinguish itself from its biggest rival, will use a larger sensor. Patents for APS-C compatible lenses have been found online, with many suggesting Photokina as a possible release date. Clarke continued, "They still sell 45-50% of the DSLRs in the world, and if they don't enter the CSC market, I'm sure it will take a long time to erode that advantage, they still make very popular SLRs." Speaking to us earlier in the year, David Parry from Canon UK said that he believed compact system cameras to be "a great idea" but was unable to comment on whether or not Canon would be likely to produce its own.